[OFFICIAL] SFO 2.0: Almost Time for Dan, Nash. Later: Captain America. SFO 2.0: Almost Time for Dan, Nash. Later: Captain America. Activate your hype thrusters, everyone! A handful of Patriots have done it again. Captain America has reached 100% and that Dream Goal has been unlocked. His official release date? August 25-26, 2017! Stay tuned for more news and a possible speech from TMyApp. One thing I'm happy to see is the number of smaller donations that also contributed to this Dream Goal being unlocked. The high rollers should not shoulder this burden alone. Remember guys, every donation, no matter how small, pushes a goal forward. The SFO Staff is again voting on colors today that will be available for VIPs choosing. Nash and Dan are on their way to your PC, SFO-style, in a matter of hours! TMyApp is putting the finishing touches on Dan and Charlie as we speak. Peep the top scores section every few hours as we power toward July 1st for a nice tease. Will the Dallas Nash color make the cut? 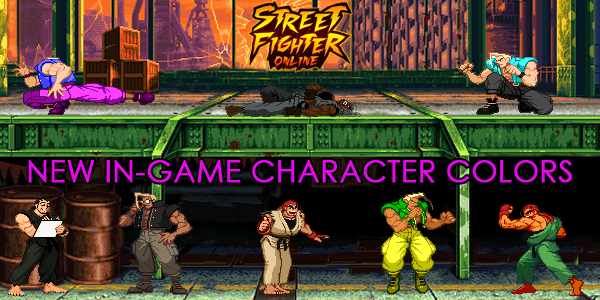 Will Charcoal Dan (an old favorite color for Akuma) make it in the end? Find out when SFO 2.0 launches on July 1st, 2017! Featured colors created by blockattack (#1, #3, #7), YoureGonnaLuvMe (#6, #8) and TotalReincarnation (#2, #4, #5. #5 Nash is also inspired by an idea from RoseSapphire). Last edited by TitaniumFist; 06-30-2017 at 07:26 AM.